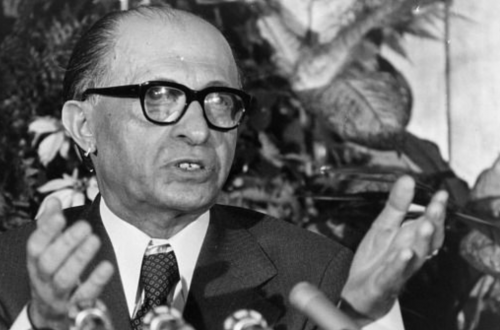 “Israel, the enemy of mankind, the enemy of humanity, which is creating disturbances every day and is attacking our brothers…, must realise that its masters are no longer accepted in the world and must retreat. They must give up their ambitious designs, their hands must be severed from all the Islamic countries and their agents in these countries must step down. Quds Day is the day for announcing such things, for announcing such things to the satans who want to push the Islamic nations aside and bring the superpowers into the arena. Since then, these events – which are inevitably a stage for anti-Israel and anti-Western incitement – have taken place annually in many locations all over the world, including the United Kingdom, where they are organised primarily by the Islamic Human Rights Commission. This year’s event will take place on August 17th in central London. Speakers at last year’s London rally (August 21st, 2011) included Lauren Booth and a representative of Hizb ut Tahrir Britain, Abdul Wahid, both of whom called for surrounding countries to launch an all-out war on Israel. Participants carried signs advocating the destruction of the State of Israel and many expressed support for the proscribed Iranian-backed terror organisation Hizballah. An additional speaker also made racist statements regarding President Obama. The organization of an event which promotes – year after year – racism, incitement to racial hatred, support for terror organizations and incitement to violence should, in theory at least, be at odds with the Islamic Human Rights Commission’s status both as a registered charity in England and Wales and a body with special consultative status at the United Nations Economic and Social Council. It should, in theory, have disqualified the IHRC from being considered a worthy partner for the British Police Force’s anti-terror units and the British Parliament. However – to date – it has not. Founded in 1997, the mission statement of the Islamic Human Rights Commission on its Charity Commission web page claims that its aim is “To promote human rights and equality and diversity (in particular good race relations) throughout the world for the benefit of the public.” The style and content of the IHRC’s annual ‘Al Quds Day’ events, along with much of its additional campaigning, suggest that “good race relations” are in fact far from being its true aim. The Charity Commission’s guidelines on charities and terrorism include clauses which would appear to be at odds with many of the activities of the IHRC and its officials. 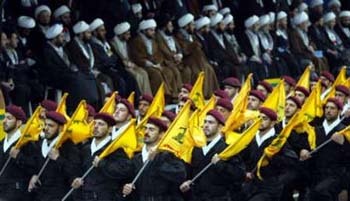 Whilst UK law proscribes only the ‘military wing’ of Hizballah, there is no separate flag for its political wing, meaning that the abundance of Hizballah flags at Al Quds Day rallies can certainly be viewed as ‘reasonable suspicion’ of support for a proscribed terrorist organisation, particularly when viewed in the context of other material present and the speeches made at those rallies. Hizballah military parade, Al Quds Day 2002, Nabatiyeh, Lebanon. The repeated organisation of rallies at which Hizballah flags are carried and worn (including by IHRC officials and employees) along with placards stating “We are all Hizballah” and the collaboration with known members and sympathisers of Hamas, leaves little room for doubt as to the IHRC’s active support for those proscribed organisations. The Charity Commission of England and Wales has to date not seen fit to take action either on these annual blatant displays of support for terrorism or on the subject of the IHRC’s incitement to violence and racial hatred. Neither, it seems, has the Charity Commission paid much attention to the nature of the less public activities and connections of some of the IHRC’s founders, officials and functionaries and the question of whether such people are appropriate as part of a government-recognised and approved body – again despite its own recommendations. In June 2005 the IHRC organised a conference entitled “Towards a New Liberation Theology: Reflections on Palestine” at SOAS in London, in collaboration with the Tehran-based NEDA Institute for Scientific Political Research & Studies. The director of NEDA, Jawad Sharbaf, made something of a name for himself in December 2005 by writing to Holocaust denier Roger Faurisson to express his commiserations at the UN decision to designate International Holocaust Memorial Day (the correspondence can be viewed on Faurisson’s site here). Among the speakers at that IHRC/NEDA organised conference (in 2009 the addresses were later published as a book by the IHRC, with Sharbaf as editor) was Hizballah member Rima Fakhry, who was interviewed by the Guardian during her visit to London. Other speakers included one of the IHRC’s founders – Saied Reza Ameli – and two members of its advisory board – Muhammad Al Asi and Achmad Cassiem. Achmad Cassiem is head of the South African Islamist group ‘Qibla‘ (which was categorised as a terrorist organisation by the US State Department) and its offshoot PAGAD, as well as head of the Islamic Unity Convention. According to the South African government, members of Qibla have trained in Libya and Pakistan and some have fought with Hizbollah in Lebanon. The group seeks to establish an Iranian-style Islamic regime in South Africa and Cassiem has visited Iran. Cassiem frequently compares and links Israel to the former apartheid regime in South Africa and not only rejects the two-state solution to the conflict, but openly advocates violence as a means of dismantling Israel. “… Armed struggle is of course essential because in the Quran armed resistance, armed struggle is ordained by Allah – the first time armed struggle is made permissible for Muslims is in Surah Hajj -surah 22 ayat 39, Allah says ‘permission is given to you to fight because you have been wronged’ – that principle essentially means that the only people in the world who have the sole justification for resorting to armed struggle, to violence, to force are the oppressed people – nobody else has that right or justification. “A major principle has evolved through centuries of armed, struggle against oppressors worldwide; that it is irrational, illogical, and obscene for the oppressors to tell the oppressed how they should respond to their own oppression. We endorsed that principle here in South Africa, and we endorse it on behalf of the Palestinian people. This means that the Zionist Regime, its lackeys and supporters cannot, may not and should not be allowed to propose any solutions. This would specifically exclude the idea of a two-state solution: that is, a Zionist State and a Palestinian State existing side by side on the land of the Palestinian people. Tova Herzl [israeli ambassador] frequently mentions that the Zionist State is only the size of the Kruger National Park; our position is that even if the Zionist State is the size of a postage stamp it has no right to exist. At an ‘anti-war’ rally in Trafalgar Square in London on September 19th 2005, Cassiem urged the crowd to adopt the slogan “one oppressor – one bullet”. 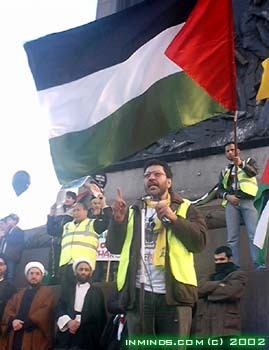 (Note the introduction by Anas Al Tikriti of the Muslim Association of Britain and the Cordoba Foundation, with IHRC chair Massoud Shadjareh standing close by, draped in what appears to be a Hizballah flag). Another advisor to the IHRC is Muhammad Al Asi of the US –co- founder of the Institute for Contemporary Islamic Thought and formerly of the Islamic Centre of Washington – who is frequently to be found on the lecture circuit and is closely linked to the Iranian regime. IHRC founder Saied Reza Ameli is also a former director of the Institute of Islamic Studies and co-founder of the Islamic Centre of England (ICEL) which was established in 1996 by Ayatollah Mohsen Araki – Khamenei’s representative in Britain at the time – and acts as a ‘support organisation’ to the IHRC in the organization of the annual Al Quds Day events. The ICEL also organizes conferences and events promoting the Iranian regime and its ideology. Between 2006 and 2009 Ameli was an Honorary Research Fellow at Birmingham University in the UK. Ameli has written for the ‘Palestine Internationalist’ (which formerly included the IHRC’s director of research Arzu Merali on its editorial team) and appears frequently at IHRC-organised conferences such as the one mentioned above. The IHRC also engages in campaigning for so-called ‘prisoners of faith‘. One of its ongoing campaigns involves Omar Abdel Rahman – currently serving a life sentence in the United States due to involvement in the 1993 World Trade Centre bombing plot. Zakzaky is a member of the International Assembly of Ahlul Bayt – the Iranian organisation which promotes Shi’ite Islam and Khomeinist ideology around the globe. According to this document, Zakzaky is also an advisor to the Islamic Human Rights Commission. Sheikh Ibrahim Al Zakai (far right) at an IHRC-organised seminar in London in October 2010 together with (R to L) Saied Reza Ameli (co-founder IHRC, Tehran University), Massoud Shadjareh (co-founder and chair IHRC), Mohideen Abdul Kader. Were one to look for proof of the fact that the IHRC is just one of several Iranian support groups at work in the UK rather than an actual ‘human rights’ organization as it claims to be (and upon the basis of which it was allotted both Charity Commission recognition and UN consultative status), one need look no further than the IHRC’s co-founder and chair Massoud Shadjareh – seen here at the 2010 Al Quds Day event – who, when asked about the very real human rights abuses in Iran, can only reply “I don’t know what you’re talking about”. In contrast, Shadjareh is an active campaigner for Aafia Siddiqui, (sentenced to 86 years of imprisonment in 2010) who he claims is being “oppressed by non-Muslims”. The Islamic Human Rights Commission under Shadjareh’s leadership is – as mentioned above – just one of several pro-Iranian organisations operating in the UK. Like all of them, it takes a virulently anti-Western and anti-Israeli stance, of which the annual Al Quds Day march is but one small part. Like many others, it is also involved in attempts to boycott Israeli goods, anti-Israel campaigning, propaganda and delegitimisation. The IHRC also played a part in the infamous ‘Durban I’ conference in 2001, to which it sent a team of 13 representatives and where it presented a paper entitled ‘Apartheid in the Holy Land‘, written by IHRC researcher at the time Nafeez Ahmed. It continued to play a role in follow-up events in 2009. The above represents just a small taste of the activities of the IHRC and the personalities involved with that organization: the annual Al Quds Day march is just the tip of a very large iceberg. The difference between the IHRC and other elements of the Iranian support network in the UK is that it has Charity Commission approved status, has been courted by the British government and holds consultative status at the UN. 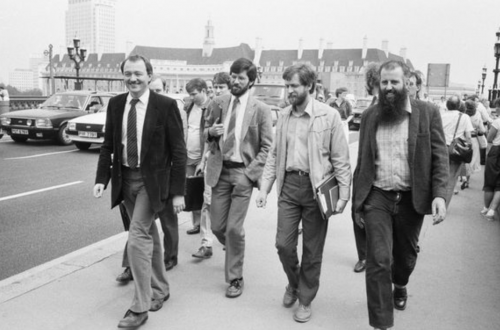 The continuation (or not) of that current state of affairs rests ultimately in the hands of the British government which can, if it so wishes, act to alter the current status quo in which the term ‘human rights’ is being used and abused by a group of sympathisers with and activists for one of the most repressive, abusive, discriminatory, terror-enabling regimes plaguing the modern world – with the UK government’s rubber stamp. The British Prime Minister David Cameron recently stated that his country will do “everything it can” to help track down the perpetrators of the murders of Israeli holiday-makers in Bulgaria. If he is serious about combatting terror both at home and abroad, then he will no longer be able to tolerate the situation in which, on the one hand, his government passes legislation and invests resources to prevent terrorism but yet at the same time permits supporters of the world’s worst terror-nurturing regime to glorify and promote Iran’s terror proxies on London’s streets.